It is raining but I am not complaining because I know it is snowing many other places! You can even see the rain drops on my ELB lid! 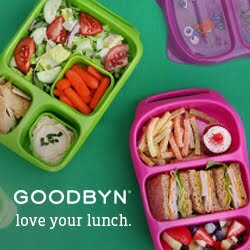 We packed our Easylunchbox with sweet strawberries, orange slices, Naturebox Cranberry Almond bites and two Lunch Punch fish sandwiches with candy eyes. This lunch is so cute, it would cheer me up in any weather! Oh my goodness, I love the tessellating fish! Too cute!! So cute to use the swirly bread! Visiting from Diana's party - I'm always looking for cute ways to present food to my grandkids!